One of the most popular colors in general, blue is also a favorite choice in women's shoes, falling in line behind black and shades of brown. And, while it may not be the most exciting color in the world, blue has many positive connotations. It conjures a feeling of trust in people. It also represents calmness, serenity, safety and loyalty. Of course, there are as many shades of blue as there are women who will wear them. Below, I'll address some of the most popular shades, along with what colors to wear with them. But before we get into those details, let's take a really quick look at a color wheel. It will help explain the basics, so that, in the future, you can choose the right shade of blue shoes on the fly. If you look at this simple color wheel I've provided, you'll notice that blue sits between aqua (a shade of green-blue) and indigo. 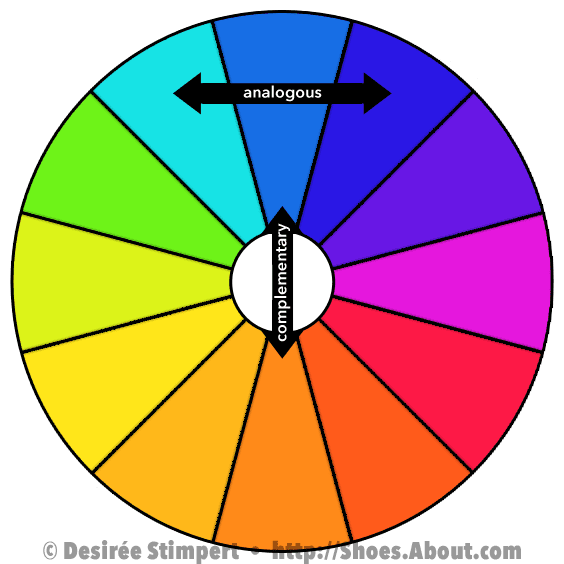 Colors that are next to each other on a color wheel are considered analogous colors. Color theory suggest that these colors work very well with each other. But the real fun starts when you look at the colors that are opposite of each other on a color wheel. These are contrasting or complementary colors, which means that each hue is intensified when paired with the other. As you can see, blue is opposite of a orange shade. Wear these two colors together and you'll have instant contrast. In some cases, the combination might seem too harsh, but at other times, the added pop of a complementary color is exactly what the stylist ordered. Of course, this is an extremely simplified wheel and example. As we all know, the color "blue" could mean one of a million shades. And even when we get more specific by specifying a shade like "green-blue," it still isn't a term that is universal enough to guarantee good results. On top of all that, there are several different ways of using the color wheel to come up with a result that is generally considered pleasing. For example, you can select two or three colors that are of the same tone (the shade of a color) and put together a cohesive look that way as well. Or, you can scrap the color wheel all together, and just look for a harmonious color scheme, like two or three colors you might find together in nature. Perfect for fall and winter, and also a favorite in warmer weather, dark shades of blue look fantastic with white. So good, in fact, that there's an entire genre of fashion that features those two shades nearly exclusively: nautical. The problem is, this color combination is so often used in conjunction with a seaside theme that it's easy to look nautical even when you're not trying to. If you want to wear navy blue shoes with white -- and avoid getting ship-related comments -- my first tip is to skip wearing stripes. Instead, look for floral or geometric print items that incorporate navy and white into them. Other colors that look great with these deep shades of blue include fuchsia, deep orange and nearly any shade of green. I'm especially partial to wearing dark blue shoes with yellowish-greens, like chartreuse and lime. As seen in the color wheel example above, orange is the complementary color of mid-tone blue, so wearing the two together will make for a very dynamic combination. Other colors that look great with bright and royal blues include light, bright and mid-tone blue-greens; nearly any shade of purple; white; and black. When you're working with shoes that are bright like these, my best tip is to either go all the way by wearing them with a vivid print dress or blouse. Alternatively, you could choose a true neutral, like black, white or gray, and allow your shoes and other accessories to provide the pop of a single bright color. Muted and dusky shades of blue have such a nice, soft, relaxed vibe that they're perfect for pairing with light to medium neutrals and earthy shades like creams, taupes, tans, and beiges. These colors are also a natural for wearing with your favorite jeans. or shades of rich, chocolatey brown. Pastel shades of blue are extremely appealing to a lot of women, but because they're so light, they're not always as easy to work with as some of the other blue shades. Naturally, white works wonderfully with light blues. And, your next best bet is to pair these colors with light to medium earthy neutrals, or just about any shade of gray. Black can also be an awesome match for light blue, but you'll need to be diligent about the rest of your accessories. Keep a simple, limited color scheme. If you wear powder blue shoes with a black dress, you'll want your belt, bag, and any non-metallic jewelry to be as closely matched to your shoes as possible. So far, so good. It's when we move beyond neutrals that things start to get a little tricky. But all you really need to do is match the tone of your clothing to the tone of your shoes. 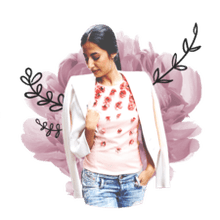 For example, unless both shades are found in a print you're wearing, stick with equally soft shades like peach; pale yellow; soft to mid-toned pinks; lavender, and minty shades of green. Light and bright shades of greenish blues and blueish greens are perfect for spring and summer, while darker shades of teal and turquoise are especially well-suited to cooler weather. On top of all that, they're also some of the most fun shades of blue to work with. Perhaps that's why some class of teal, turquoise, or aqua is nearly always trending. If your shoes are a bit more on the blue side of the spectrum, look to pair them with shades of orange, especially light to mid-tones like corals and peaches. Darker blue shades that are more on the green side will contrast nicely with deep shades of red and rust. And nearly any shade of blue that falls into this watery category will look fantastic with more true blues and greens. They're just magic together. Another magical combination is pairing shades of blue-greens with browns, as well as other mid to dark earth tones and neutrals. The contrast in these combinations is so pleasing, you don't really need a lot of other choices. What Color of Shoes Work Best with White Jeans? Find Out Now. What Should You Wear with Ankle Boots? You Can Rock Tights With Any Shoes or Boots. Here's How.